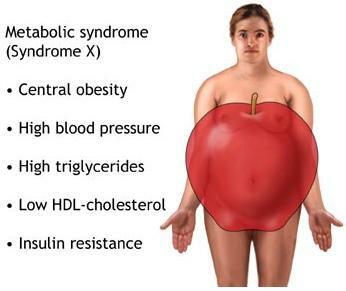 Metabolic syndrome is a combination of several disorders, including hypertension, hyperglycemia, dyslipidemia, and obesity. It often directly results in a series of diseases, such as hepatic steatosis, diabetes, and cardiovascular diseases. Insulin resistance is the common pathophysiological basis for metabolic syndrome. Recent reports show that in adults over age 20, the prevalenceof metabolic syndrome is 34.3–38.5%. Although the symptoms of metabolic syndrome do not manifest until adulthood, the origin of this disease can typically be traced back to teenage and childhood ages, and even to intrauterine stages. In 1993, Barker et al. first reported that birth weight is closely related to adult hypertension and diabetes, breaking the traditional view that metabolic syndrome is primarily related to adult obesity. It has been demonstrated that fetuses with intrauterine growth retardation (IUGR) induced by prenatal nicotine exposure are susceptible to adult metabolic syndrome. Intrauterine growth retardation (IUGR) refers to the poor growth of a baby while in the mother’s womb during pregnancy. Specifically, it is defined as a developing baby weighing 10% or two standard deviations less than the mean body weight of other babies at the same gestational age. Smoking can cause many health problems; however, some women insist on smoking during pregnancy. Exposure of the human fetoplacental environment to smoking has been linked to adverse birth outcomes, including IUGR, pre-term delivery, and sudden infant death syndrome (Cnattingius et al., 1999; Pollack et al., 2000; Tuthill et al., 1999). Among all smoking products, nicotine is considered to be one of the aversive components that perturb fetal development (Yildiz, 2004). Nicotine can be quickly absorbed into smokers’ bloodstream through the oral cavity and lung. It can then quickly cross the placenta to reach the embryo and accumulate in fetal blood and amniotic fluid. Clinical research reported that serum cortisol level was elevated among smokers compared with nonsmokers (Kirschbaum et al., 1992). The results indicated that nicotine acted via a central mechanism to indirectly stimulate the release of adrenocorticotropi (ACTH) from the anterior pituitary corticotropes, following increased serum glucocorticoid level. Furthermore, these effects were blocked by mecamylamine, a nicotinic acetylcholine receptor (nAchR) antagonist (Matta et al.,1998). These results are in agreement with recent findings from two other independent laboratories (Lee et al., 2005; Mendelson et al., 2005), which suggested an involvement of nAchR in nicotine mediated up-regulation of adult glucocorticoid synthesis. There is also an enhanced mRNA expressions of StAR and P450scc in the matern aladrenals, which further suggests that nicotine can increase the glucocorticoid synthesis in maternal adrenals. Prenatal overexposure to maternal glucocorticoid induces inhibition of the hypothalamo-pituitary adrenal (HPA) axis and hypoactivity of adrenals in fetus (Lesage et al., 2001). It also has been found that perinatal disturbances of the HPA axis could program or imprint the development of tissues and organs, producing IUGR and later dysfunctions and diseases such as cardiovascular, metabolic, neuroendocrine and behavioral phenotypes, which resulted from the impaired adrenocortical function involved glucocorticoid feedback in fetus (Kapoor et al., 2006 ; Li et al., 1999). Placental 11-β-HSD-2, by regulating fetal exposure to maternal glucocorticoid, crucially determines fetal growth and the programming of later disorders. Low levels of placental 11-β-HSD-2 make fetus overexposed to maternal glucocorticoid. 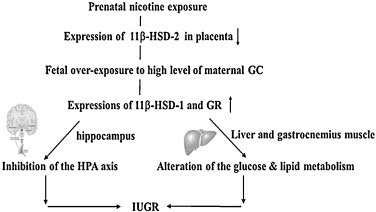 Prenatal nicotine exposure reduces the expression level of placental 11-β-hydroxysteroid dehydrogenase-2 (11-β-HSD-2), which is responsible for the inactivation of mother-derived glucocorticoid (GC). This observation suggests that prenatal nicotine exposure resultes in fetal over-exposure to maternal GC. Recent reports have suggested that the altered programming of the HPA axis is most likely involved in the underlying mechanism behind the intrauterine origin of adult metabolic syndrome (Kanaka- Gantenbein, 2010), and GC is known to be an important factor in insulin resistance and metabolic syndrome in adults (Anagnostis et al., 2009). Under physiological conditions, the placental barrier builds and maintains a GC concentration gradient (approximately 10- fold) between the mother and the fetus during pregnancy. Placental 11-β-HSD-2 is a GC-inactivated enzyme responsible for preventing the fetus from being over-exposed to the maternal GC (Burton and Waddell, 1999); therefore, placental 11_-HSD-2 is a crucial factor in determining levels of fetal GC (Barbazanges et al., 1996). The expression levels of placental 11-β-HSD-2 and fetal adrenal StAR and P450scc were all significantly reduced following nicotine exposure. Following prenatal nicotine exposure, the expression levels of GR in the fetal hippocampus were significantly increased, while the expression levels of fetal hypothalamic CRH and adrenal StAR and P450scc were all remarkably reduced. These data suggest that nicotine exposure induces fetal over-exposure to maternal GC, further inhibiting the activity of the fetal HPA axis via negative-feedback regulation. Hippocampal 11-β-HSD is involved in regulating the binding of GC to GR. 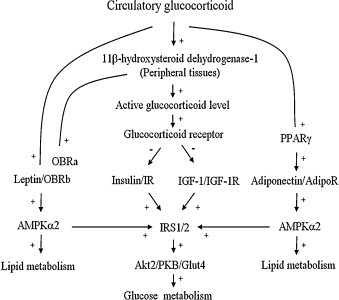 11-β-HSD can be subdivided into types 1 and 2 that catalyze the interconversion of active glucocorticoids (cortisol in humans and corticosterone in rodents) and inactive 11-keto form (cortisone in humans and 11-dehydrocorticosterone in rodents), thereby modulating the concentration and function of GC in target tissues. 11-β-HSD-2 is widely expressed in the fetal brain during the period of mid-embryonic development and then gradually decreases. Conversely, 11-β-HSD-1 and GR are limitedly expressed in the fetal brain during mid-embryonic development, reach their peak during the period of late embryonic development, and remain until after birth (Thompson et al., 2004). et al., 2002). GC was implicated in the upregulation of hippocampal 11-β-HSD-1 activity via positive feedback loop regulation, and enhanced 11-β-HSD-1 activity may further increase the local level of active GC in the hippocampus (McNeil et al., 2007; Seckl, 1997; Yang et al., 2007). The expression levels of 11-β- HSD-1 and GR in the fetal hippocampus were increased following prenatal nicotine exposure. Additionally, fetal HPA axis activity was inhibited. High levels of fetal GC induced by nicotine cause increased expression levels of 11-β-HSD-1 and GR in the fetal hippocampus, resulting in the inhibition of fetal HPA axis function and development. Circulatory GC has been reported in regulating the IGF/insulin (Radosavljevic et al., 2005), adiponectin (Lopez- Bermejo et al., 2004), and leptin (Brabant et al., 2005) signaling pathways. In fetal circulation, IGF-1 is mainly derived from the liver, and its expression and secretion can be repressed by GC (Hyatt et al., 2007). Additionally, GC induces the expression of PPAR_ in the differentiation of 3T3-L1 preadipocytes (Wu et al., 1996), and PPAR_ itself not only promotes adiponectin expression in adipocytes but also induces the expression of adipoR1/2 in macrophages (Hammarstedt et al., 2005). Change in GC concentration (treatment with additional GC or removal of the adrenal gland) in the fetal blood is positively correlated with leptin levels. It has been confirmed that the fetal liver, which expresses high levels of 11-β-HSD-1 and GR, is particularly sensitive to circulating GC levels during the third trimester (McNeil et al., 2007). Following exposure to high levels of GC induced by prenatal nicotine treatment, the expression levels of 11-β-HSD-1 and GR areincreased in the fetal liver. Gene expression levels involved in the IGF/insulin signaling pathways (e.g., IGF-1, IGF-1R, and IR) are inhibited, while gene expression levels involved in the adiponectin and leptin signaling pathways (e.g., AdipoR2, OBRa, OBRb, and AMPK_2) are elevated. These changes occurrs at both the pre-receptor and/or receptor levels. These data indicate that the high levels of fetal blood GC induced by prenatal nicotine exposure may slow down glucose metabolism and accelerate lipid metabolism by increasing the expression levels of 11-β-HSD-1 and GR in fetal peripheral metabolic tissues, resulting in fetal growth retardation. these observations may involve over-exposure to maternal GC and activated GC metabolism in various fetal tissues. The observed alterations and potential mechanism may provide an experimental basis for explaining the susceptibility to adult metabolic syndrome for offspring with IUGR induced by prenatal smoking or nicotine exposure. Although tobacco consumption is rather high in modern society and people attempt to use nicotine gum or patches as replacement therapy for smoking addiction during pregnancy, prenatal smoking and nicotine exposure should be avoided.